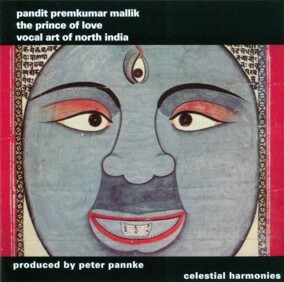 The Prince of Love: Vocal Art of North India is the first co-production between Celestial Harmonies and Rundfunk Berlin-Brandenburg. Dhrupad originated in the 15th century in the pastoral landscape of Braj situated between Delhi and Agra, where the blind poet Surdas and his contemporaries had envisioned and re-enacted the childhood of the cowherd god Krishna and his beloved Radha. The rise of dhrupad was the birth of what is called North Indian classical music in modern parlance. Characterised by slow movements and deep registers, dhrupad has always been considered an exclusively masculine art. Moreover, dhrupad is mainly a vocal art; the only instrument which could adequately reproduce the movements and range of a deep male voice was the sonorous rudra vina, an instrument which was said to have been shaped by Shiva itself. Within a very short time, dhrupad and its counterpart dhamar, became so immensely popular that the nawabs and maharajas, the rulers of the country, invited the musicians from their secluded ashrams and temples on the banks of the Jamuna river into their courts. Even if the royal patrons were devout muslims, the content of the songs, telling about Krishna and other gods and godesses, always remained the same. By the 19th century, it had been eclipsed by khyal—a new performance style which allowed the artists more room for showing off their virtuosity. Unknown to Western musicologists, the art of dhrupad had survived in such remote places as Darbhanga in North Eastern Bihar, close to the Nepalese border and in the temples of Varanasi. Shri Amarnathji, the head priest of the Shankat Mochan temple, had the idea to summon all the musicians he knew of to revive the ancient tradition at a festival at Tulsi Ghat. It proved to be a tremendous eye-opener to the few Westerners who gathered there, including Peter Pannke, this recording’s Producer. The Mallik family’s musical history starts with the two brothers Radhakrishna and Kartaram who arrived at the court of Darbhanga in what is nowadays Northern Bihar, close to the Nepalese border, around 1775. The Mallik’s, one of only two families who have managed to keep alive dhrupad, the most ancient and austere style of North Indian music, are famous for their unique, very rhythmically accentuated style of dhrupad singing and their rich repertory of compositions, including rags which are sung exclusively by their own family. They have toured Europe and the United States and thanks to a new generation of curious listeners and the growing interest of contemporary composers who were fascinated by the subtleties of intonation, dhrupad came back into the concert halls. Their particular skills have made the family famous among Western scholars and lovers of North Indian vocal music. Not wanting to distinguish between ‘higher’ and ‘lower’ styles, as they did not want to differentiate between richer and poorer patrons of their art, they performed with equal willingness and grace in the biggest concert halls and in the most modest temple or private house when they felt their music was received with love, singing dhrupad and all the other styles of North Indian music—khyal, tarana, thumri and bhajan, the musical forms you can hear on this CD—with equal competence and ease. Premkumar, the youngest son, teaches vocal music at the University of Allahabad. Prem, the first part of his name, means ‘love’; Kumar is a title given to a person of noble descent—The Prince of Love: Vocal Art of North India, his first solo CD, reflects the true spirit of his family. 1 Rag Todi - Alap 11'39"
2 Rag Todi - Dhrupad 6'37"
3 Rag Abhogi Kanhada - Alap 12'53"
4 Rag Abhogi Kanhada - Dhamar 5'49"
5 Rag Basant - Sultal 6'59"
6 Rag Jog - Chota Khyal 11'26"
7 Rag Jog - Tarana 6'38"
8 Rag Misra Pahadi - Thumri 8'30"